(Nanowerk News) Rechargeable electric vehicles are one of the greatest tools against rising pollution and carbon emissions, and their widespread adoption hinges on battery performance. Scientists specializing in nanotechnology continue to hunt for the perfect molecular recipe for a battery that drives down price, increases durability, and offers more miles on every charge. One particular family of lithium-ion batteries composed of nickel, cobalt, and aluminum (NCA) offers high enough energy density—a measure of the stored electricity in the battery—that it works well in large-scale and long-range vehicles, including electric cars and commercial aircraft. There is, however, a significant catch: These batteries degrade with each cycle of charge and discharge. "The relationship between structural changes and the catastrophic thermal runaway impacts both safety and performance," said physicist Xiao-Qing Yang of the U.S. Department of Energy’s Brookhaven National Laboratory. "The in-depth understanding of that relationship will help us develop new materials and advance this NCA material to prevent that dangerous degradation." To get a holistic portrait of the NCA battery's electrochemical reactions, researchers in Brookhaven Lab's Chemistry Department and Center for Functional Nanomaterials (CFN) completed a series of three studies, each delving deeper into the molecular changes. The work spanned x-ray-based exploration of average material morphologies to surprising atomic-scale asymmetries revealed by electron microscopy. 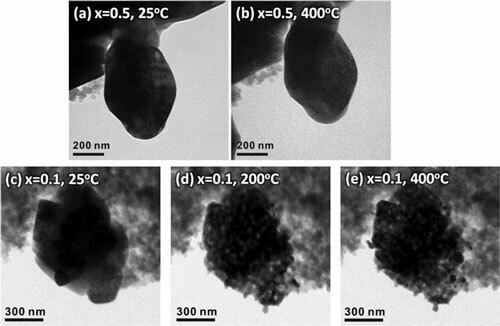 The first study, published in Chemistry of Materials ("Correlating Structural Changes and Gas Evolution during the Thermal Decomposition of Charged LixNi0.8Co0.15Al0.05O2 Cathode Materials"), explored the NCA battery using combined x-ray diffraction and spectroscopy techniques where beams of high-frequency photons bombard and bounce off a material to reveal elemental structure and composition. These x-ray studies were conducted at Brookhaven’s National Synchrotron Light Source (NSLS). 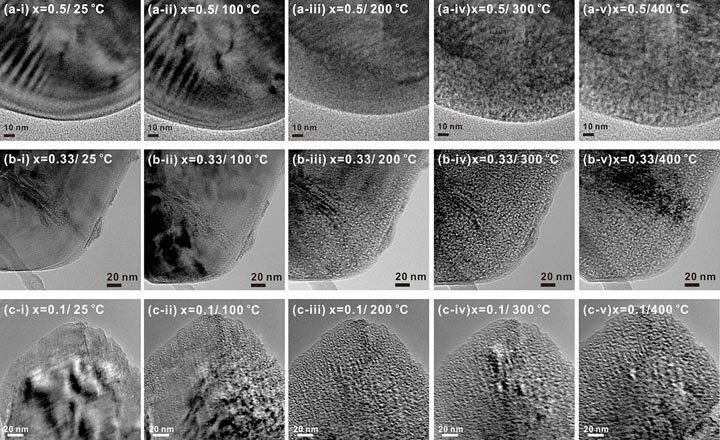 These in situ transmission electron microscopy images reveal that an uncharged NCA nanoparticle remains largely pristine as the temperature climbs from 25 to 400 degrees Celsius (top). In an overcharged sample, however, heavy structural degradation emerged and oxygen was released at ~200 degrees (bottom). As the temperature rose, x-rays struck the sample and revealed the widespread transition from one crystal structure to another. The team also measured the amount of oxygen and carbon dioxide released by the NCA sample—a key indicator of potential flammability. 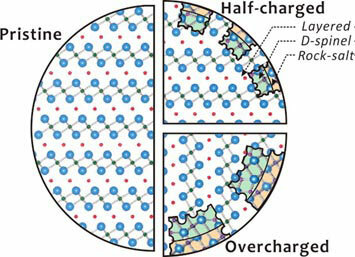 The next study, also published in Chemistry of Materials ("Investigation of Changes in the Surface Structure of LixNi0.8Co0.15Al0.05O2 Cathode Materials Induced by the Initial Charge"), used transmission electron microscopy (TEM) to pinpoint the effect of an initial charge on the battery’s surface structure. The highly focused electron beams available at CFN revealed individual atom positions as an applied current pushed pristine batteries to an overcharged state. Diagram showing the NCA structural transformation from discrete layers in the pristine sample to disordered spinel and rock-salt configurations as the charge increases—largely a result of oxygen being released from the material. The final study, published in Applied Materials and Interfaces ("Investigating Local Degradation and Thermal Stability of Charged Nickel-Based Cathode Materials through Real-Time Electron Microscopy"), used in situ electron microscopy to track the heat-driven decomposition of NCA materials at different states of charge. The atomic-scale structural investigation under variable temperatures and charge levels offered the most comprehensive portrait yet. The collaboration found that even though pristine and uncharged NCA samples remained stable up to 400 degrees Celsius, charging introduced the usual decomposition and vulnerabilities. The full story, however, was much more nuanced. The corroborating data in the three studies points to flaws in the chemistry and architecture of NCA batteries—including the surprising atomic asymmetries—and suggests new ways to enhance durability, including the use of nanoscale coatings that reinforce stable structures. The studies were funded as part of a Korean Government “Global Research Laboratory,” which exists to support and take advantage of leading experimental capabilities abroad. This program specifically supported collaborators Seong Min Bak and Sooyeon Hwang and their research at NSLS and CFN, both DOE Office of Science User Facilities.